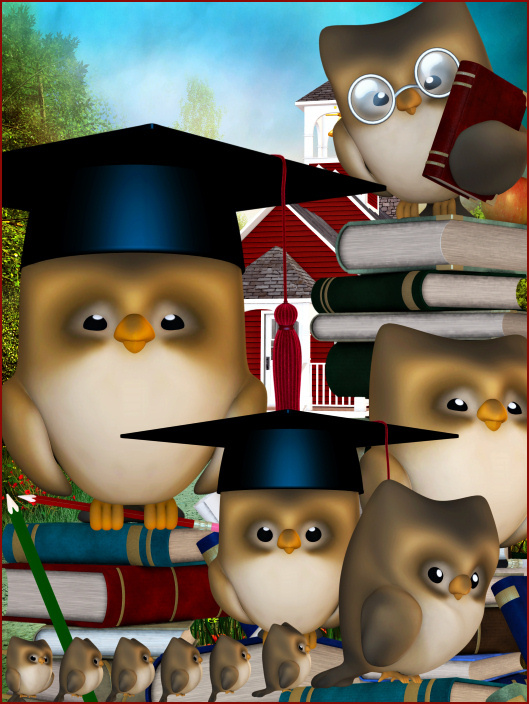 Irresistible little owls and their books, pencils, and graduation caps. Create designs that celebrate learning. Wise Owl Tubes in celebration of teachers and hard-working students. Go back to school with this package of cute Wise Owls. These graphics would be great for graduation or any other school or teacher-related designs as well. Most of the owls have black graduation hats, but a few wear alternate colors. The little red school houses, chalkboards, books, and other school props seen in the promos are in my Little Red Schoolhouse package. This kit was a joy to work on, lots of fun. It was difficult to stop creating these adorable owls. I think you’ll have fun working with these graphics as well. And I’m sure you’ll get a lot of mileage out of these graphics as they would be useful for so many types of creative projects They’d even make excellent Valentine’s Day cards, tags, and scrapbook elements. 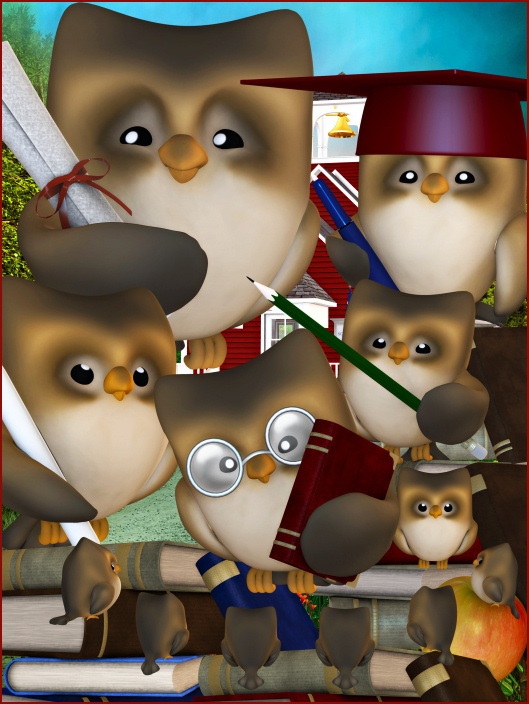 In fact, I can imagine a scrapbook designed around these owls–the thought makes me want to get to work. There are 38 royalty free, high-quality clip art png images included in this package. All of these graphics have transparent backgrounds making it easy for you to use them as tubes or nozzles–or merely to drop into your design. The size of these images varies but all are 300 DPI and are approximately 1000X2000, making them great for print projects. They can be used for personal or commercial projects, including web design, template design, candy wrappers, scrapbooking, etc. This package has been divided into two zip files which are approximately 40 MB each.